oh yes please! i adore this space!!!!! 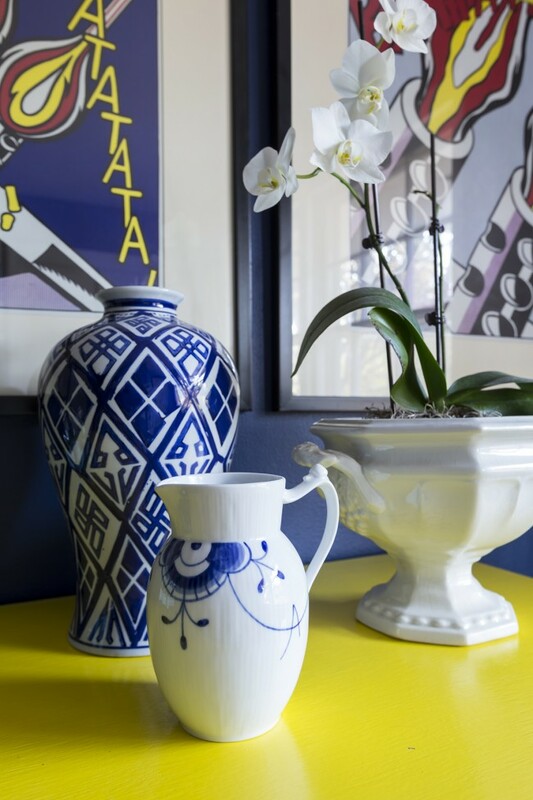 love the moody blue walls and the white contrast then that bright pop of yellow! Thanks Cassie! You are so sweet! This is gorgeous! ANd I love the yellow. I have browns and dark blues in my living room but I wanted to spice it up a bit. I’m gonna start incorporating bright yellows now. LOVE ! Wow! What a transformation. 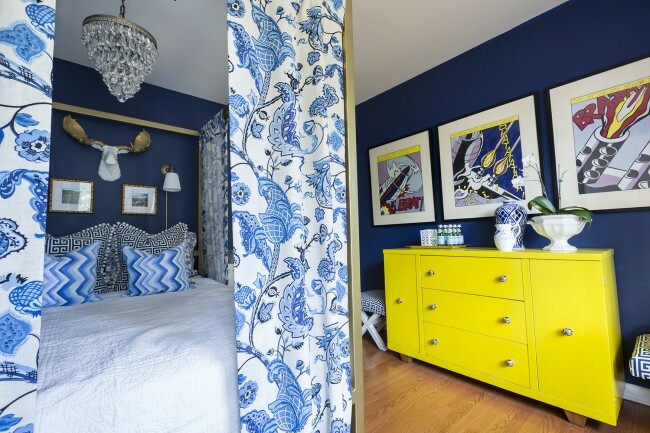 I love the navy walls paired with that fun pop of yellow on the dresser. Very pretty!! Thanks Kate!!! I love the dresser too! Sarah – that is e sweetest thing you could have said. I’m flattered!!!!! What an incredible transformation! I actually saw a sneak peek on Instagram and assumed you were one of the sponsored designers! That is so sweet of you Jeannine! It was a lot of fun! And really gets you in gear to finish! 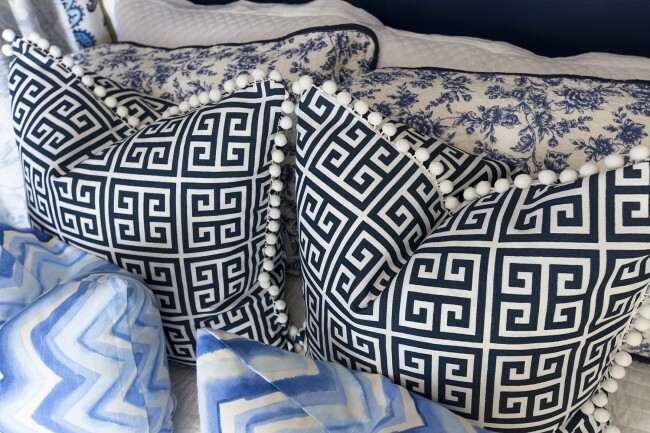 Love the greek key stools and pillows! You did a great job! Congrats!! 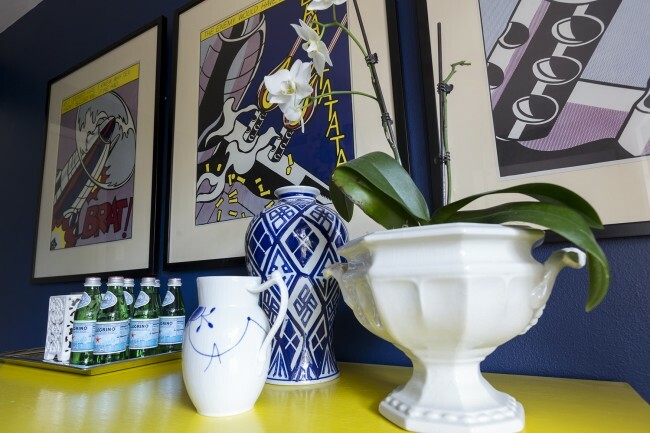 Yes…you kept the yellow credenza! Beautiful makeover. It looks like a completely different space! Ya I like the yellow too! The white console ended up just being too small for the space! STOP IT! This is so fab. I LOVE the art installation over the bed. Great job, lady! Congrats!!! Thanks Katy! I wasn’t sure what to do over the bed and I just started playing!!! Thanks for stopping by! Shut up!!!! This is just too fabulous! I don’t even know what I love the most because it is all just too good! Congrats on creating such a perfect space!!! Thanks Tricia! I’m jealous of my guests now!!! Now that is some DRAMA! LOVE the gold and white and YELLOW against that blue. The artwork is so clever. What a fun room! 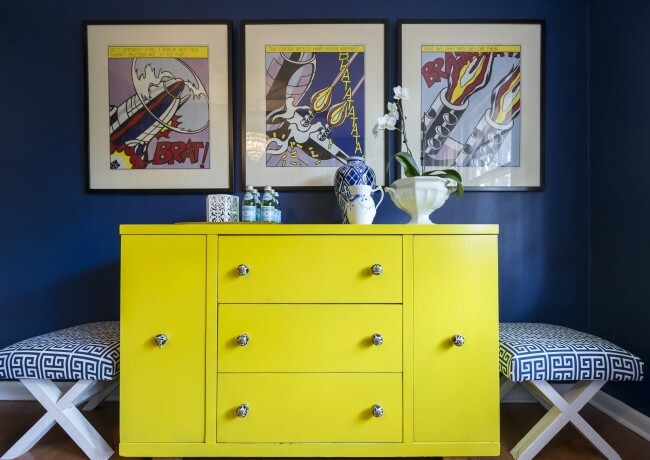 This room looks amazing and the Chartreuse dresser brings the room to LIFE. Great job! I love the idea of pulling the comic artwork into the mix. Classic blue and white with that artwork is such a wow. The room is truly inspired. My only quibble is the unlined panels on the bed. 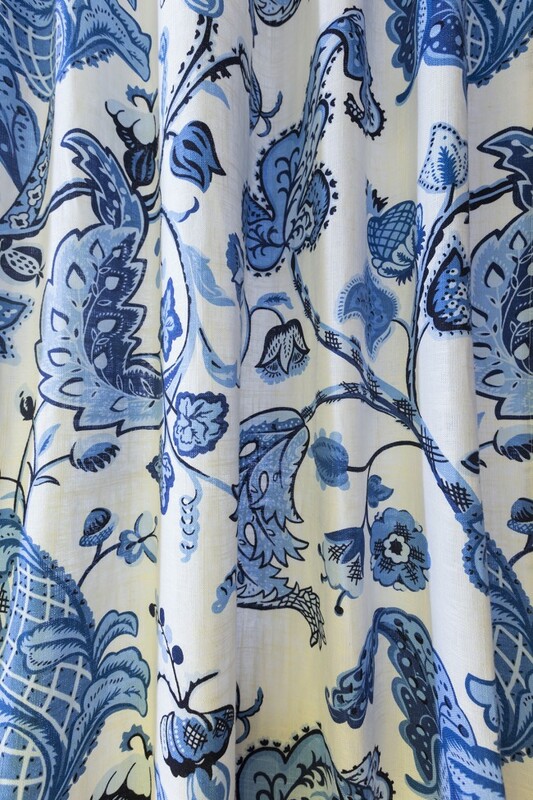 Seeing the backside of the pattern takes the room down a notch. It’s 98 percent perfect, but lining those panels would make it perfect. This is incredible! I’m so impressed by how much you did yourself. 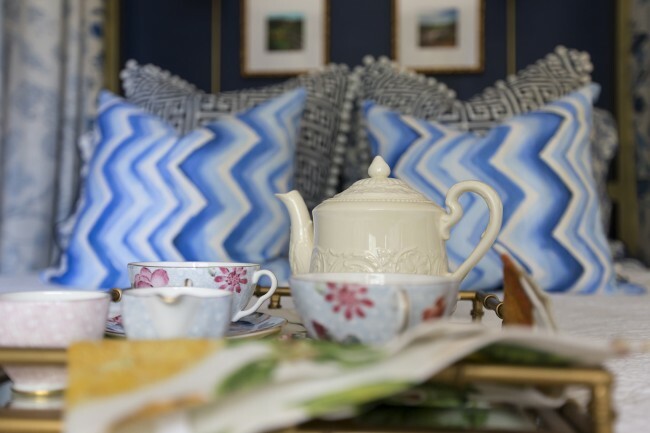 The blue and white palette is classic and the pops of color are perfect! What a transformation!! 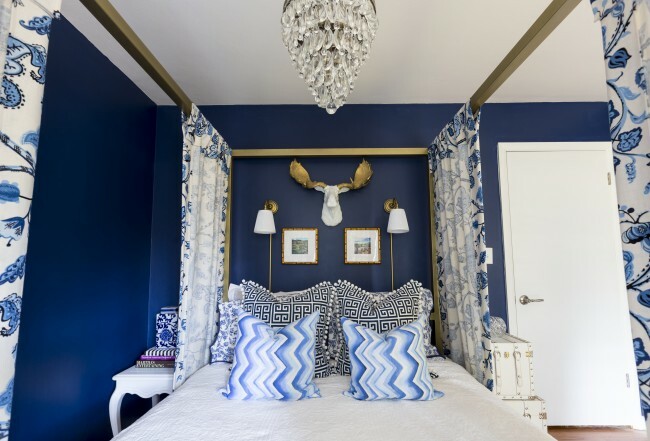 The blue is gorgeous on the walls and that bed is a stunner! Thanks Lisa! Also thanks for the ikea hack inspiration!!! I love them!! Holy hell! What a change! It looks amazing. This room has so much life! Love that. The wall color is just divine. This. is. fantastic!! 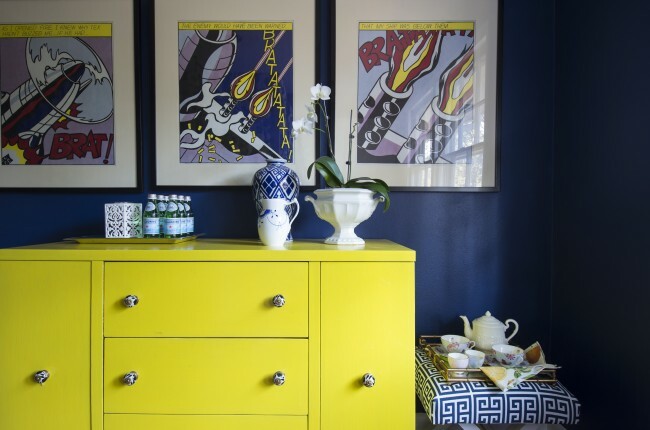 I love the navy and the yellow dresser and the bold art- all the patterns are gorgeous together!! Such a beautiful transformation – great job!! Oh my gosh! 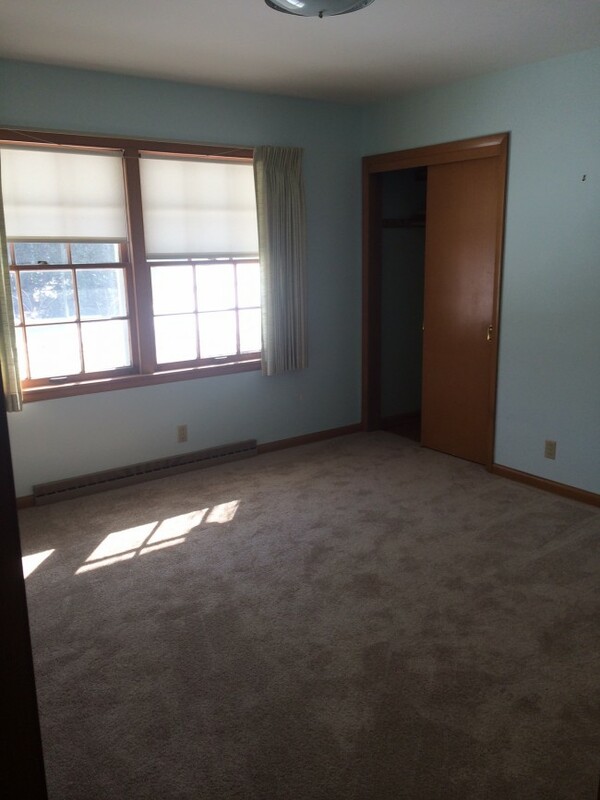 This does NOT even look like the same room. 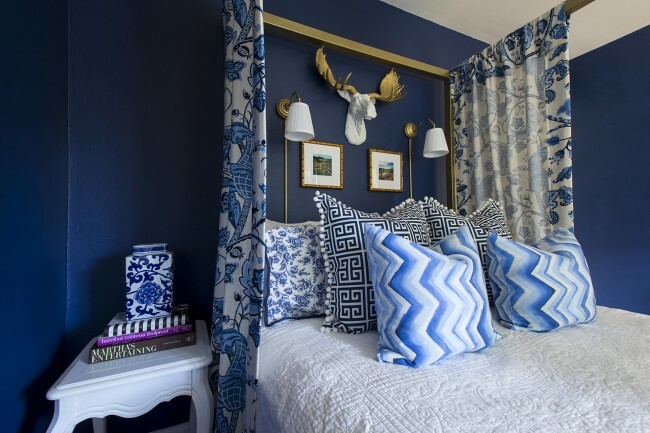 Love the bold colors, the bright dresser, and the pillows. 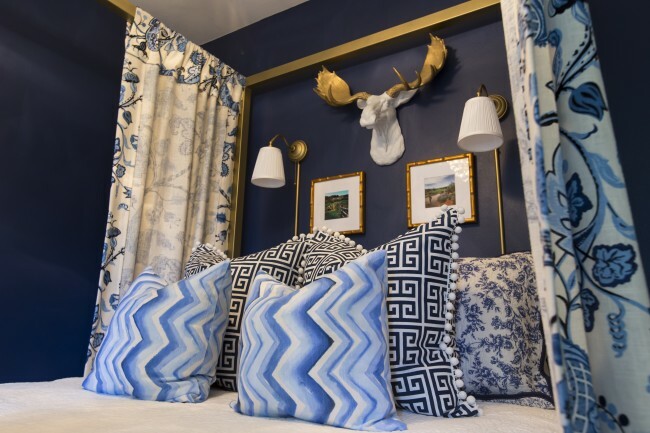 The patterns and decor are so fun! Holy cow this space is amazing! The navy is soooo beautiful! What a beautiful bedroom. 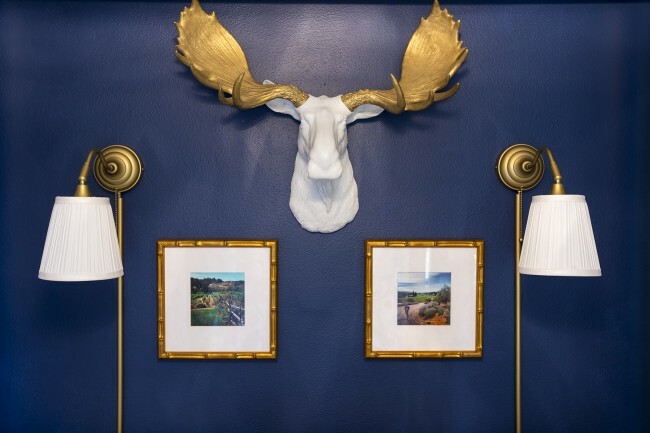 I love the navy walls with the pops of color! Great job! Hi Lianna! This makeover is absolutely beautiful! I love the color scheme. Those textiles you chose are soooo gorgeous! Congrats on an amazing makeover! Pinning this! So glad to have met you through the ORC. This turned out stunning! I love the superhero art! Love your room! Blue, white, and brass is one of my favorite combos. Great job! Stunning! Boy that was a lot of work in 6 weeks…..the fabric is so beautiful and I love the yellow chest! Those navy walls are killing me! Stunning transformation! I love the panels on the bed, the wall color…so much eye candy. Well done! Wow!!!! What a transformation! Love the fabric you used for the panels.